Woohoo 2013 is coming! We safely made it past the Mayan predicted end of the world! Be honest, I’m not the only who has been thinking about that, right? Well, 2013 is coming fast and I want to have mega New Years Eve Celebrations because who doesn’t love mega celebrations? 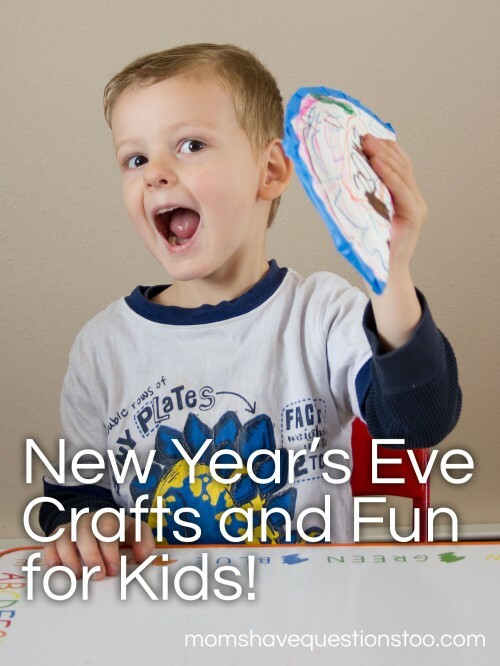 I want my kiddos to have a blast on New Year’s Eve also, but I definitely don’t want them staying up until midnight. So, I figure I will celebrate with them starting in the late afternoon and still make them go to bed at their regular bedtime. When 11:30 comes around, I will wake them up and let them ring in the new year. Now, on to the celebrations. 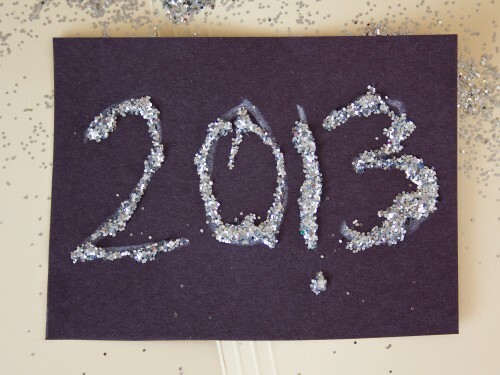 Here is what I will be doing with my kiddos on New Year’s Eve to celebrate 2013. Write 2013 on a note card sized piece of black construction paper. 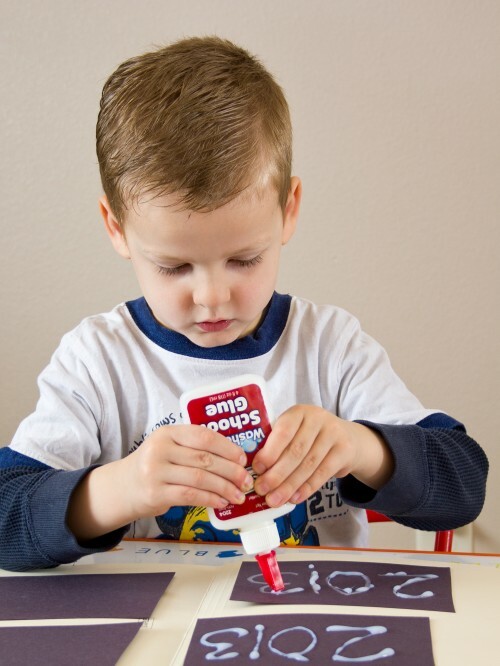 Have your child trace the numbers with glue. Pour glitter over it and shake off extra glitter. 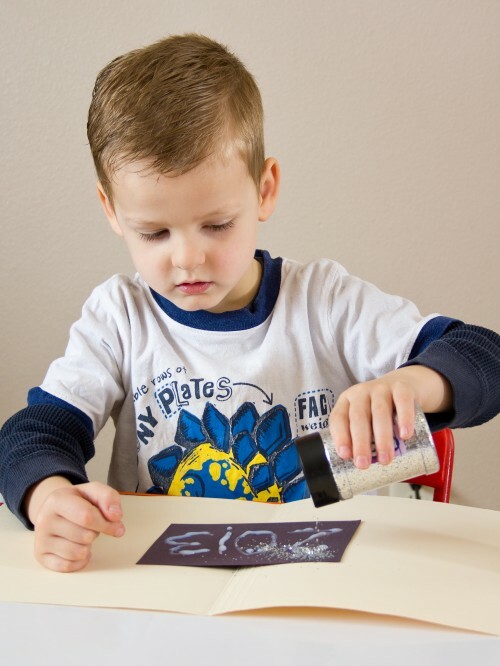 I had Little Bear do the glittering over a file folder which made cleaning up the excess glitter really easy. Make as many as you want (we will probably do about 8). Let papers dry completely, and then hang from the ceiling. 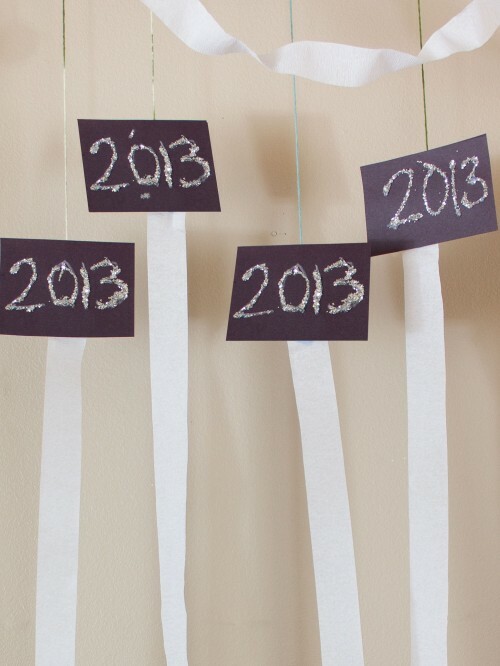 Hang black, white, silver streamers if desired. We’ll be leaving these up for all of January. 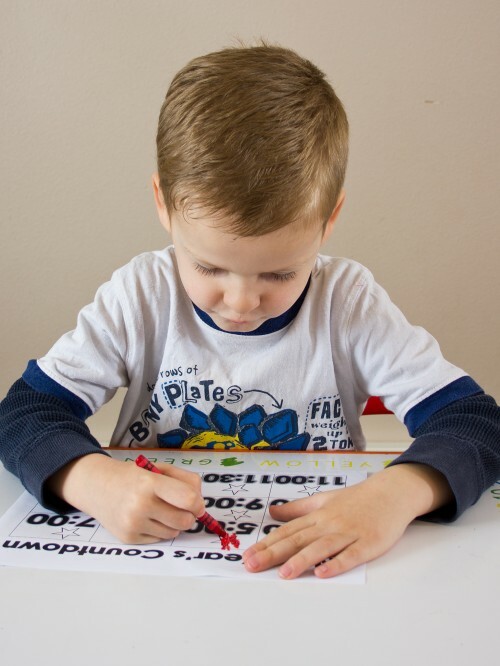 Decorate the back side of a paper plate with paint, glitter, markers, crayons, stickers, etc. 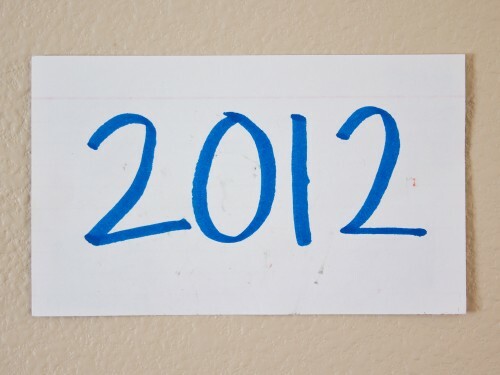 We wrote 2013 on one half. Once decorated as desired, fold paper plate in half. Staple or tape the edges together until there are only 2-3 inches that are left open. 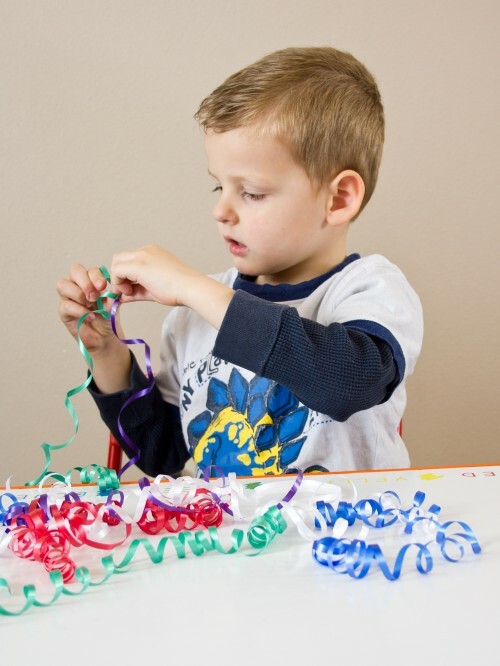 Fill the paper plate with about ¼ Cup rice, beans, or anything that will make noise. Tape the plate the rest of the way. Tell your child they get to shake it at midnight. 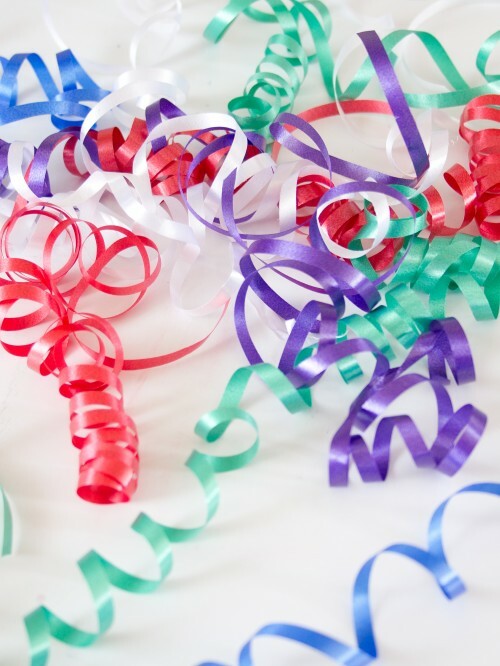 Get a bunch of curling ribbon (hopefully you have some leftover from Christmas) and cut several 1-2 foot lengths. Curl the ribbon. 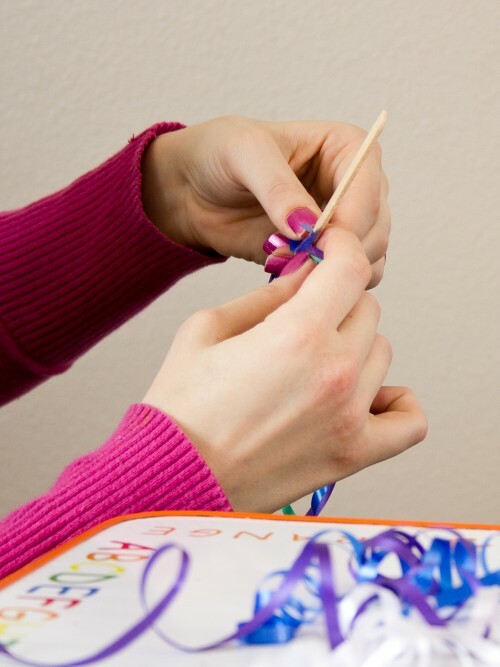 Have your child decorate a popsicle stick with paint, markers, glitter, crayons, stickers, etc. 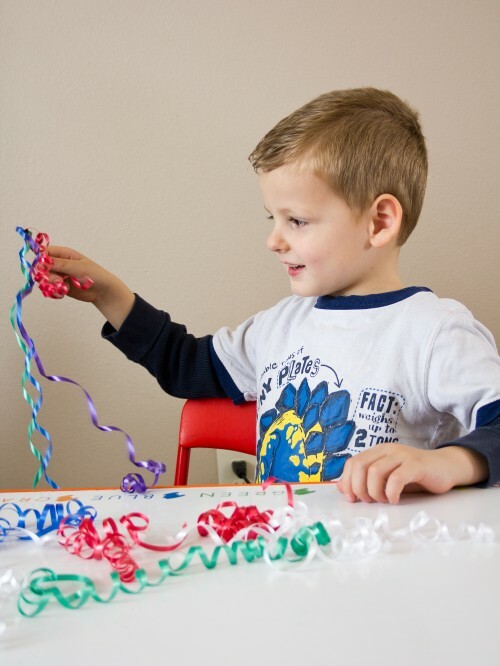 Have your child choose some ribbons to put on their popsicle stick and tape the ribbons to the popsicle stick. Wave around like mad at midnight (and throughout the night just for fun). Simply print off this New Year’s Countdown and color each time as it passes. My kids will be asleep for several boxes. I’ll just have them color those when they wake up around 11:30. 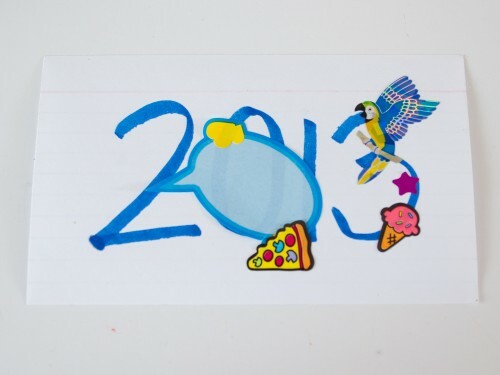 Our preschool calendar has a little note card for the year 2012. I will make another 2013 note card that is blank except for the year. My kiddos will get to decorate the 2013 note card any way that they want and it will go up on the preschool calendar right at midnight. If you missed it, be sure to check out some of Cassidy’s New Year’s Eve Traditions that she posted earlier this week!